As a returning dance diplomat on Western Michigan University’s exchange to Panama, I was amazed by the overwhelming feeling of familiarity during the myriad of today’s events. While we are a different group, visiting different locations, with a different group dynamic, one unifying factor creates the sense of familiarity in our groups mission and energy: our love for dance, and our desire to share that with others. I had the pleasure of teaching two classes today at Xielo, and it seemed as though I never left. The creative ways of communicating through movement rather than language, the rush of improvising and thinking on your feet if elements of your lesson plan don’t quite work out, and the irresistible excitement and enthusiasm exuded by the students that seeps into your being are all aspects of teaching in Panama that I found so fulfilling in my previous exchange. However, this fulfillment only came after days of trial and error, patience, and at times pure frustration with myself and my inability to communicate. I was thrilled to find that this time, my methods for dealing with these barriers and frustrations flooded back, and in ways were more successful, allowing me to instantly feel fulfillment, and simply enjoy the children and what they have to offer. And with that, I have to give my shoutout of the day to the beautiful people of Panama. The tangible passion for dance, the sweet smiles and giggles from the students as I make a fool of myself while trying to speak Spanish, the eagerness to absorb every ounce of information we have to offer, and their willingness to let a piece of their soul into your heart, even without communicating verbally, are all reasons that this country is able to feel so familiar, even when my experience here is so limited and the exchange itself is so different. You are instantly welcomed into the Panamanian dance culture, as if you were born and raised in the country itself. You feel at home. It feels familiar, like putting on your favorite summer outfit after a long Michigan winter; distant, but exciting, comforting, and undeniably your own. 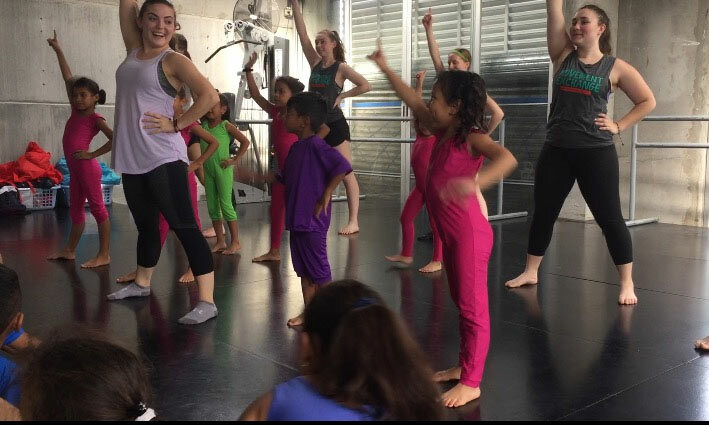 This feeling was also apparent when our group visited and took class from the dance students at the University of Panama. Witnessing the overwhelming sense of community as Panamanians spoke broken English, and Americans spoke broken Spanish, all with the common goal of learning, connecting, and inspiring through dance. So shoutout to Panama for making our return so effortless, fulfilling, and encouraging. I can’t wait to take on the rest of the week and to continue moving to change!